One of the most successful lines of toy vehicles ever is Buddy L, introduced by Fred Lundahl and named for his son. In 1910, Fred A. Lundahl started the Moline Press Steel Company in East Moline, Il. He provided quality pressed steel parts such as automobile fenders, truck and farm-implement parts, to McCormick-Deering, International Harvester, and 36 automobile manufacturers as well as the truck and farm machinery industry. During the summer of 1920, Fred began to make toy model steel vehicles for his 5-year old son Arthur Brown Lundahl using 18 and 20 gauge scrap metal from his parts manufacturing business. Fred beleived that the quality of most manufactured toys and trucks from the period was poor, and they were generally not built to last. He wanted his son to have indestructible playthings to resemble the newest adult toy, the automobile, and to spark imaginative play. The first model that he built was one that represented an International Harvester truck. Fred's toys were originally only made as special items for his son, but they soon caught the attention of other children and their fathers, and demand grew. A severe economic downturn in 1921 pushed Moline Pressed Steel Company to the verge of bankruptcy. When orders for the manufacture of stamped automobile parts dried up, Lundahl began thinking of the truck he created a year earlier for his son and was inspired with the idea of manufacturing toys. In 1921, Fred converted part of his machine shop into a toy-making shop. These vehicles that Mr. Lundahl made for Arthur and his friends caught on so well in the neighborhood and beyond, that in 1921 he began to devote his entire career to toys as evidenced by the new name of the company created for his vehicle loving son who was also known as Buddy L. The 'L' was needed to distinguish little Arthur from the other nicknamed Buddy's in the neighborhood. 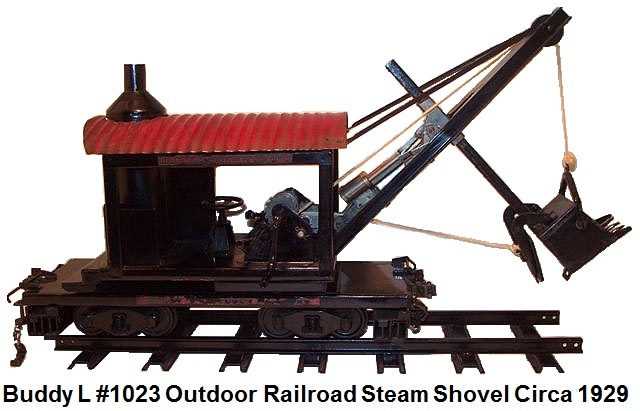 Lundahl designed and produced 3 samples (#200 Express Truck, #201 Dump Truck, #220 Steam Shovel) of the all steel toys and took his samples to the 1922 New York Toy Fair. He received a lukewarm reception as toy buyers thought the prices were too high. However, the toys became noted for their size and quality and eventually sales took off. Now the Moline Pressed Steel Company began making miniature trucks, cars, tugboats, fire engines, construction equipment, delivery trucks, airplanes, trains and other toy vehicles in metal and selling the model vehicles under the Buddy L name, using the same heavy-gauge steel that they used in the manufacturing of parts for automobiles and trucks. The immediate and soaring popularity of these sturdy and durable toys resulted in Moline Steel shifting exclusively to the manufacture of these models within a few years. Seeking to expand the sales of the toy trucks and vehicles, Lundahl set out to gain new outlets via major department and retail stores such as Butler Brothers and Marshall Field in Chicago. When both of those stores declined his proposals, Lundahl refused to give up. To demonstrate the durability of his products, Lundahl was known to have placed his full weight of 220 lbs. on one of the trucks. It held without so much as a creek or crack. A major breakthrough was achieved when the famous F.A.O. Schwarz toy store of New York placed an order for 500 units. According to Lundahl, this was “the real beginning of my toy business.” Through the mid 1900’s and beyond, the Buddy L name continued to signify why it is referred to as the toughest toys on wheels. With a heavy concentration of steel and wooden vehicles, Buddy L not only became a familiar household name, but stood for quality and assured all parents and grandparents who purchased products for their children and grandchildren that they could trust Buddy L for years to come. These steel toys did come with a hefty price tag, but it was justified by the quality and durability. The initial truck model was soon joined by an express truck, dump truck, steam shovel, and Ford automobiles. Sales of the Buddy L line of toys were greater than expected with more than 76,000 units shipped in 1923. In 1925 Lundahl modernized his plant to accomodate new manufacturing methods. and the toy line was expanded to 20 unique items. Buddy L produced a wide variety of vehicles, from trains and construction equipment to delivery and emergency vehicles to Ford cars and trucks. All had moving parts, some had removable cargo, and a few were very elaborate, thus providing kids with a great deal of play value. 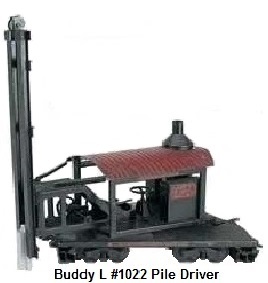 The durability of the Buddy L toys is what led to their success, but their popularity also came from their many moving parts, and in some cases, from intricate features such as hydraulics that actually worked. The early vehicles averaged from 20 to 26 inches and were sturdy enough for a child to ride. This indoor/outdoor utility insured Buddy L a place in toy vehicle history. More than 100 million Buddy L steel toys eventually drove out of the E. Moline factory. In 1927, a complete line of model railroad equipment was started. The trains were big and heavy, fairly detailed, they were ⅝ inch scale, and ran on two rail track that was 3¼" gauge (three and a quarter inches between the 2 rails). The track had heavy rolled steel rails welded to steel ties. 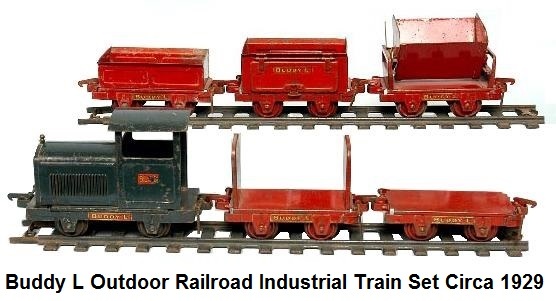 The rolling stock consisted of open cars such as #1007 hoppers, #1005 gondolas and #1006 flats, as well as a 21 inch #1002 box car, #1003 tank car, #1004 stock car, #1008 side dumping ballast car, #1020 wrecking crane, #1021 clamshell dredge, #1022 pile driver and #1023 steam shovel. And of course a 19 inch #1001 red caboose. 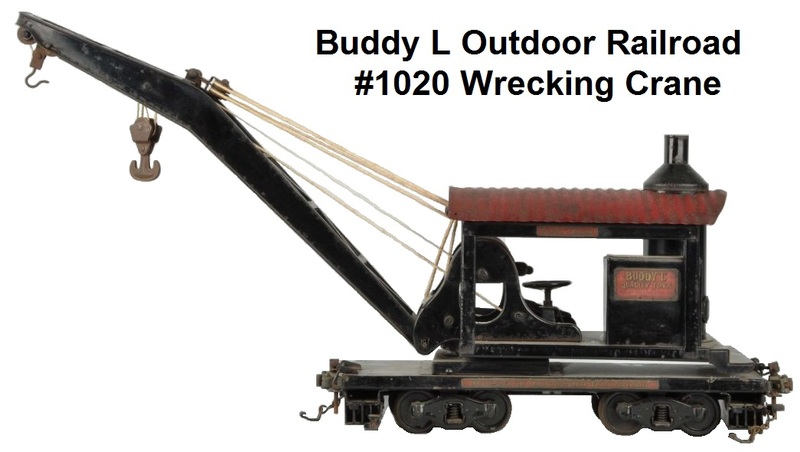 Overall, there were 14 different pieces of original Buddy L railroad equipment produced, including a single #1000 Pacific type 4-6-2, highly detailed non-powered locomotive and 8-wheeled tender, faithfully copied after a Rock Island prototype. This model is a reproduction of the big compound steam engines originally used in the fast freight service. Fred Lundahl had previously worked for the Rock Island RR, and the Locomotive shops were located at Silvis, Illinois, just a few scant miles from the Moline Pressed Steel Factory. The model featured sand domes, air tanks, whistle, brass bell, running boards, steps, headlight, knuckle couplers, cowcatcher, and brass rail trim. The locomotive included working side rods and valve gear that moved as the engine rolled along the track. Loco and tender measured 42 inches in length. It even had a hinged door on the firebox. All the trains were made of heavy gauge welded sheet steel and were equipped with die-cast AAR type working couplers. 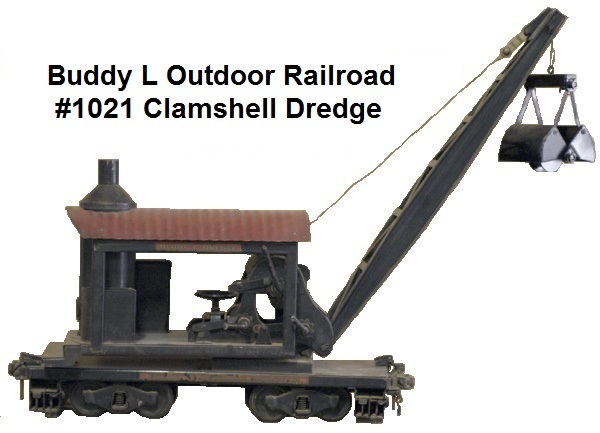 The Buddy L Outdoor Railroad made its first appearance at the February 1926 New York Toy Fair. Accompanying the shows presentation, true to life color, baked on enamel pressed steel models, was the finest full line brochure ever printed. It was in reality more a pocket catalog, featuring all (28) of the complete Buddy L Outdoor Railroad cars and related structures & equipment. The advertising was compelling, highlighting the imposing size and strength of the steel cars, allowing for children to ride upon them, as well as emphasizing the reliability factor, insomuch as there was nothing electrical or mechanical that could malfunction. The design was so perfect, that cars would couple when bumped together (just like the real thing), tanks could be filled & drained, and believe it or not, a real fire could be built in the Locomotive firebox, containing an actual grate & ash pan!! This was never advertised though, as it was thought to be a potential burn hazard to small children. Buddy L asserted that "The Outdoor railroad was, THE MOST REMARKABLE PLAYTHING EVER CONCEIVED!" Both F.A.O. Schwartz & Edward K. Tryon Co. of Philadelphia included the complete line in their 1927 catalogs. Track was available in 4 foot long curved or straight sections. The curves had a 12 foot radius. The name 'Bethelhem Steel Co' was stamped on the web of the rails. There were left and right hand manual-throw turnouts (switches) that were 6 feet long. Buddy L also made steel road bed plates, steel bridge sections, steel piers, a turntable and a single stall round house section circa 1929-32, that could be assembled into a multi-unit version. 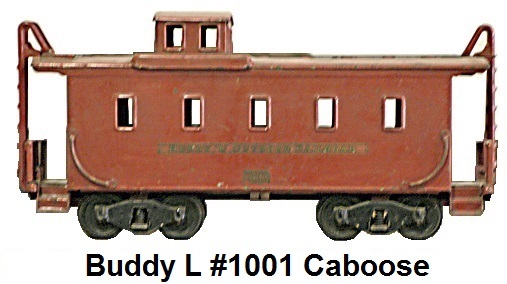 From 1929-32 a 2" gauge train was also manufactured, known as the Buddy L Industrial Train. It too was push-powered. It included a #51 Gasoline locomotive (switcher), Stake car (flat), Rock car, #54 Gondola, #55 Ballast car, and Rocker dump car. Track was stamped in 24" sections, the rail and ties were all formed from one piece of metal. Before Buddy L, most toy vehicles were made of cast iron or wood, but Buddy L's success with steel spawned competition. Companies such as Keystone, Kingsbury, Structo and Sturditoy made heavy-gauge vehicles, while Acme, A.C. Gilbert, Girard and Kingsbury produced lighter-gauge versions. Because of the heavy duty construction, Buddy L trains are suited for creation of outdoor railroads. In the 6 year period (1926-31) that the trains were manufactured, the designs never changed. Prices ranged from $27 for the locomotive and tender down to $6 for the #1006 flat car. The average freight car was listed at $8, with the wrecking crane and other specialty items somewhat more. A six-car Buddy L train set, including the engine and 20 feet of track, cost $75 when new. Because of the cost, this item was not a big seller. Production of the Buddy L Outdoor Railroad nearly bankrupted Lundahl's company and contributed to its eventual sale. Fred Lundahl had only five years to enjoy success in the toy business. In 1930, at the young age of 47, he passed away as a result of complications following surgery at Lutheran Hospital in Moline, just a few blocks from his home. The company was sold. However, the toy line would survive much longer, growing in value and fame and reaching the highest collectors' peak duing the early 2000's. After 1930 Buddy L vehicles were made using a lighter steel. Famous toy salesman Henry Katz watched the meteoric rise of Buddy L and eventually became its manufacturing representative. Subsequently, Katz purchased Buddy L from the Molene Manufacturing Company in 1941. Katz's son succeeded him and took over as President of the Buddy L Corporation and maintained offices in Manhattan. The Buddy L Burlington Zephyr Train, made 1935-36, measured 66" long x 8" high x 5.75" wide. It was an amazing recreation of its full size famous vintage counter part. The three unit toy train was fully articulated and could be pulled by the 12 inch twisted wire handle while a child sat atop the engine or could be propelled by foot power using the handle to steer. Mounted on 4 rubber tires, the 25" long engine, with a tapered roof line, came equipped with a battery powered front light. The 19 inch middle car had 2 tires at the rear and the 22 inch long 3rd car had 2 tires with a boat-tail shaped rear. These units were held together by a gravity ball receptacle. The Great Depression took a toll on Buddy L sales, although the large toys were still sold until the beginning of World War II. During the War, the need for steel for the war effort meant finding other materials, so Buddy L produced wood toy car and truck vehicles during those years. Henry Katz, head of the company on the eve of war, found a plant in Glens Falls, New York, suitable for making Buddy 'L' Victory Toys, later fondly called 'Woodies' by collectors. The company continued making the wooden vehicles after the war, but the public preferred the metal trucks Buddy L offered after 1949. After the war, vehicle size decreased and Buddy L experimented with plastics, but quickly returned to metal fabrication, although in lighter-gauge materials. In the 1970's, the company was sold to a Japanese firm that began incorporating increasing amounts of plastics into the vehicles. After several corporate reorganizations, during the 1990's the models were manufactured in China, of nearly all plastic construction, for a Canadian company. The trains produced were designed to run on Large Scale (45mm) track and were compatible with LGB or Bachmann Big Hauler products. Also in the 1990's, T-Reproductions of Johnson City, TN was authorized to make replicas of the original heavy pressed metal pre-war models, including the trains, under license from the Buddy L Corporation. A limited production run was made, including a motorized version of the classic Buddy L Pacific, and the prices were expensive, as expected. In 2009, the Buddy L trademark was owned by Path Global LLC, AKA Imperial Toy Corporation. The durability of Buddy L toys led to their success, but their popularity also came from their many moving parts, and in some cases, from the intricate features such as hydraulics that actually worked. While all Buddy L toys from the 1920's to the 1960's are collectible, most desirable are the heavy-gauge pre-war models, especially the trains. These can command prices from a few hundred to several thousand dollars. The early trains produced by Buddy L are among the sturdiest of all American toy trains and routinely sell in a higher price range. Vehicles produced by this icon of toy manufacturing promise to retain their value for years to come. Though smaller and made with more plastic than the first models of the 1920's and 1930's, Buddy L vehicles remain in production to this day. Just before Arthur Brown 'Buddy' Lundahl passed away in 1981, he wrote that his father "truly believed that the only really good playthings were those that could make a child's dreams come true, playthings you could actually do things with, ones that really worked just like the big machines they modeled."